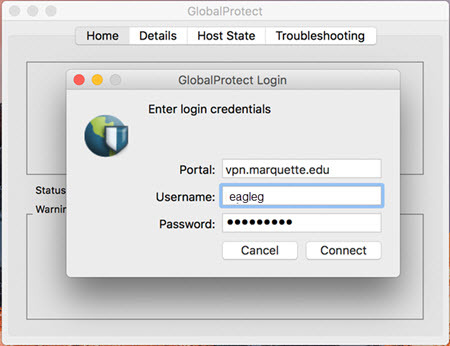 Go to vpn.marquette.edu to download the Marquette VPN client. After the client has been installed, launch the VPN client and enter vpn.marquette.edu in the portal address field. When prompted for log in credentials, in the Username field, enter your Marquette username. In the Password field, enter your password followed by a comma. Next, you will go to the hardware token issued to you by IT Services and press the green button. On the screen a 6-digit code will appear. Type that 6-digit code into the password field next to what was written in the previous step. Click Connect and you will be connected to Marquette VPN. Please contact the IT Services Help Desk if you have questions.